James E. Newberry, Jr., was born in Gonzales, Texas on August 1, 1921. He played baseball at Texas A&M University and was called to service in 1944 before he completed his degree. Second Lieutenant Newberry served with the 48th Armored Infantry Battalion, 7th Armored Division in Europe. On August 14, 1944 he was killed when a screaming mimi (nebelwerfer) hit his jeep at Senoches, France. Newberry was the first member of the 7th Armored Division to be killed in action in WWII. After the Nazi surrender in May 1945, the 7th Armored Division honored their first combat casualty by naming their parade ground in Osterburken, Germany after Newberry. 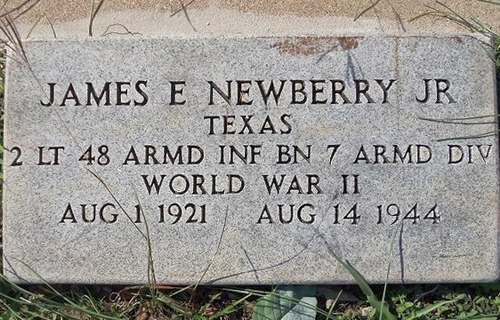 James Newberry is buried at Oddfellows Cemetery in Gonzales, Texas. Thanks to Texas A&M for help with this biography.